The Enviroguard features a modular range of instruments, detectors, power supplies and network communications that aim to cover the full spectrum of construction monitoring needs. The 15 sensor packages can detect and monitor anything from airborne particulates and wind speed to vibration, water pressure and volatile organic compounds. 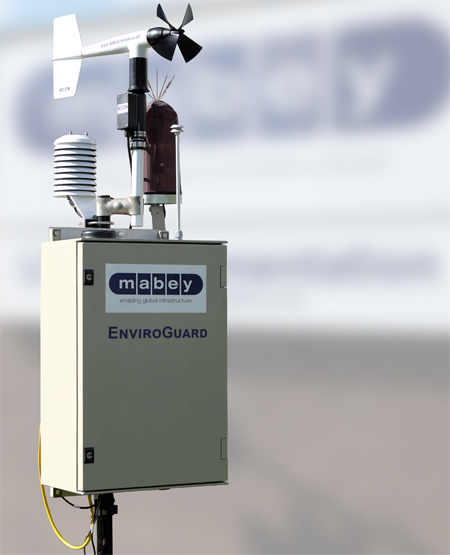 The data is continuously managed from Mabey's Livesite, a web-based suite of tools and report functions that allows users to monitor instrument readings in real time, export historical data and overlay readings. Features include the capability to predefine value thresholds for any of the sensors. When these are exceeded – or when there are insufficient readings – nominated users are informed by email. The system is housed in a lockable, rugged composite enclosure that meets or exceeds IP65. Higher IP ratings in metallic, stainless steel or Atex enclosures can also be offered. It uses standard 110v AC power and includes a 30-minute uninterruptible power supply back up. The system can also be configured with a range of low-voltage DC power solutions for continuous off-grid operation at remote sites.